Watch this space as we announce the date of the next event. Ali Sahebi says that we can become the captain of our own ship. Using personal examples and illustrative story, Sahebi shows us how to take charge of our actions and subsequently, how to find more effective control over our own life , become the person we want to be. Ali Sahebi is senior Faculty of The william Glasser Institute – International and the Director of William Glasser Institute – Iran. He completed his PhD of Clinical Psychology at University of NSW, Sydney Australia. He Worked for seven years as an A/professor of Clinical Psychology at Ferdowsi University of Mashhad – Iran. Then joined The positive psychology of Choice Theory and Reality Therapy Movement and Worked with Dr. William Glasser, the founder of Choice Theory to take Choice Theory to Iran. 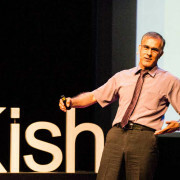 ©2015 TEDxKish.com. All rights reserved.